Explore the Christchurch Botanic Gardens on a narrated tour aboard an open-air electric shuttle that provides unobstructed views of the Gardens' variety of flowers and other plants. If you wish, you can see even more of Christchurch with optional upgrades that include the hop-on hop-off Christchurch Tram tour through downtown, a Punt cruise on the Avon River and a ride on the Christchurch Gondola. Choose the combination that interests you most, and enjoy various perspectives on the city's renewal since devastating earthquakes struck in 2010 and 2011. 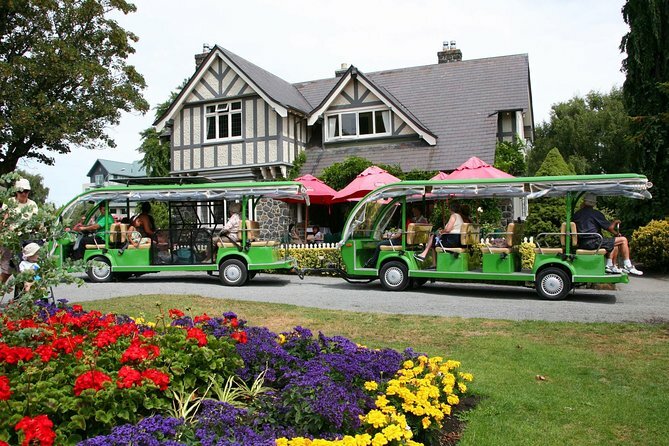 When you arrive at the Christchurch Botanic Gardens, hop aboard an eco-friendly electric-powered caterpillar vehicle for your tour through the gardens, an oasis of exotic and indigenous plants located on a 52-acre (21-hectare) preserve in the heart of the city, between Hagley Park and the Avon River. While you ride, listen to entertaining commentary from the onboard guide, and hear fun facts like which trees make the best bows and arrows. The full tour of the gardens takes about one hour, with frequent stops along the way. Disembark at any point to take a closer look at specific areas, such as tropical plants in glass conservatories, 250 different types of roses in two rose gardens, or herbs with culinary and medicinal value. Reopened after the city's last earthquake, the revamped Visitor Centre houses a cafe, gift shop and interactive exhibit about the history of plants and gardening in New Zealand. Check out photos of the Duke and Duchess of Cambridge, who visited for the center’s ribbon-cutting ceremony in April 2014. Upon booking, you will be able to choose the option to access to the elegantly restored Christchurch Tram, a heritage vehicle and hop-on hop-off tour that travels between 17 destinations in central Christchurch, including Cathedral Square, Avon River, Hagley Park, Canterbury Museum, Re:START Mall and New Regent Street. A knowledgeable driver provides commentary about the city’s history and landmarks during the ride. Hop on and off the tram at any of the 17 stops; your ticket is valid for the entire day and you can disembark as many times as you like. The entire circuit without hopping off takes about 50 minutes. When booking, you have four tour options, which are detailed in the Itinerary below. Includes the Christchurch Botanic Gardens and Christchurch Tram. The heritage vehicle stops at 17 destinations in central Christchurch, including Cathedral Square, Avon River, Hagley Park, Canterbury Museum, Re:START Mall and New Regent Street. A knowledgeable driver provides commentary about the city’s history and landmarks during the ride. Your ticket is valid for the entire day and you can disembark as many times as you like. The entire circuit without hopping off takes about 50 minutes. Includes the Christchurch Botanic Gardens, plus a ride on the Christchurch Gondola. Located in Heathcote Valley, about 15 minutes by vehicle from central Christchurch, the gondola climbs Mt Cavendish in the Port Hills. The smooth ascent takes about 10 minutes and ends at Summit Station, 1,500 feet (500 meters) above sea level. Indoor and outdoor viewing decks provide panoramic views over the Southern Alps, Christchurch, Lyttelton Harbour (Whakaraupo) and the ocean. Additional facilities include a cafe with spectacular views and a gift shop. Don’t miss the Time Tunnel exhibit, a short, amusement-park-style ride with audiovisuals that describe the natural and human history of the region. Walking and biking trails are also accessible from the summit. Includes the Christchurch Botanic Gardens, plus a relaxing 30-minute ride down the Avon River in a classic boat known as a punt. Designed for small rivers and shallow water, the flat-bottomed boat is operated by a punter who uses a long pole to propel you across the water. Take in trailing willows, leafy woodlands, the Botanic Gardens and other sights along the river while you snuggle up with your sweetie or hang out with friends on comfortable deep-cushioned seats. Umbrellas and blankets are provided. The most comprehensive option includes all four attractions for a well-rounded experience of Christchurch.